I have just returned from the breath-taking Prague for the 5th edition of the European conference of PostgreSQL, now called PGConf.eu. The “baby” once called PGDay has now grown into a 4 day conference with training, talks and social events. I was not able to attend the event in Stuttgart and Amsterdam, but I was active in Prato (2007 and 2008) and present in Paris (2009). However, I must admit that this year conference is by far the PostgreSQL conference I have enjoyed the most. Great city, very good location with excellent facilities. I expect the positive trend I have experienced so far will be met next year as well, whichever location will be picked. Finally I also had the chance to fully enjoy an event as attendee, not having been involved in the organisation or not having to present any talk. I attended 15 talks (ranging from average to very high quality), plus keynotes. It was also nice to catch up with international 2ndQuadrant colleagues, meet again long time members of the project and – most notably – make acquaintance with new members. My first thought goes to all the volunteers that made this possible (in particular local ones), PostgreSQL Europe and the sponsors. Thank you for bringing the conference to such a high quality level. Then follows my “top 5” list for PGConf.eu 2012 in Prague. Number 1: the cruise on the Vltava river, sponsored by Heroku, which was a great opportunity for community members to get to know each other. I had also the chance to speak about Barman with Gianni, Mladen, Lou, Tony, Palle, et al.. It was such a pleasure, and once again the feedback we received on Barman was very positive. The picture on the right shows myself (actually my hand) explaining the WAL archive concept in Barman, with periodical backups, differential backup, incoming directories, compression, etc. 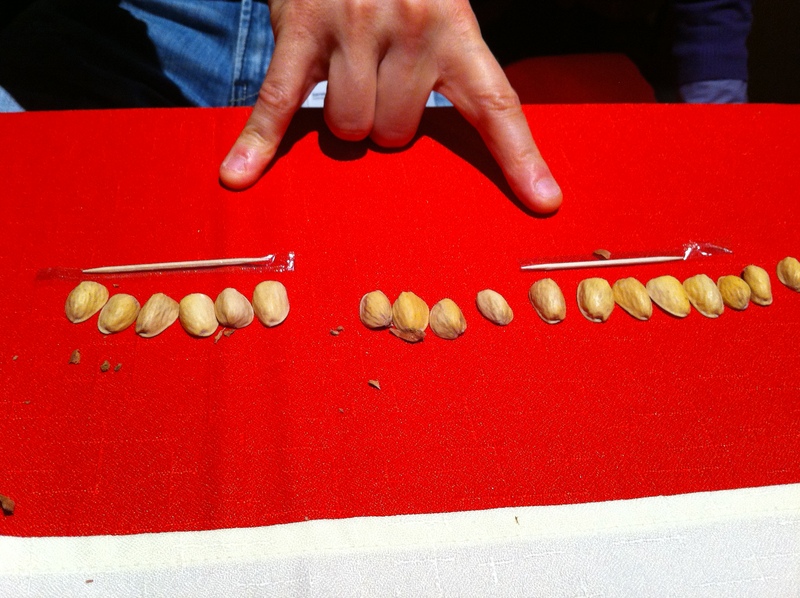 using pistachio shells and toothpicks (thanks to Mladen for sharing the picture). Number 2: the inspiring talk by Simon Riggs and Andres Freund regarding future directions for the development of multi-master replication and polymorphic logical replication through WAL decoding: I could not stop thinking about those features (actually desiring them), which will definitely bring PostgreSQL in a leading position in the market – in absolute terms. Number 3: Jehan-Guillaume de Rorthais’ talk on the integration of PostgreSQL with a cluster resource manager such as Pacemaker for automatic failover in environment with high requirements of availability and business continuity. Even though I am a fan manual failover, I believe the perfect integration of Postgres with this kind of tools is an important path to be taken. Number 4: the work my friend Peter is doing with Greg on in-database logging will draw future monitoring and log analysis tools. We do not yet see the benefits from this work, but we will as this kind of data will be collected and analysed in order to produce useful reports for DBAs. Their talk was one of the best, in terms of both content and delivery. Number 5: the talks by Vincent Picavet on PostGIS, pgRouting and related technologies. GIS are so interesting! In my reserve list: Gianni’s pgChess (great educational project! ), Harald’s closing keynote (and his meteorite slide), Magnus excellent talk on backup strategies (the only slide I think his talk was missing was an overview of the existing tools for disaster recovery with PostgreSQL – in particular Barman, WAL-E and OmniPITR just to name a few), Jonathan Katz’s (always nice to see him communicate and interact with the audience), Dimitri’s on High Availability (the part I was able to attend was great). I excuse myself with the other half of the speakers which I was not able to attend due the impossibility of real replication/mirroring of my body. So, a big “thank you” to all that made this possible and congratulations.